Ontario will be making it mandatory to engage in the Cap and Trade program. The Cap and Trade program intends to make it obligatory to reduce Carbon emissions while encouraging Carbon reduction innovation. Check out the Ontario government’s video below for more information. Contact us to learn more about adopting our Green DPS solution for your building retrofits or new builds today. We are an original equipment manufacturer for medium voltage electrical distribution equipment offering customized solutions for clients all over the world out of Canada. We simply do more with less materials for all of our products & solutions. 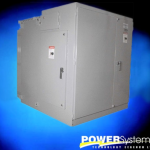 Our products include substations, transformers, EV and building powering solutions. Why we use less materials? Energy moves through materials & it takes energy to move energy resulting in losses. We use up to 50% less materials with our Green DPS, and our Mini and Micro Substations are compact too. This allows your building to enjoy more valuable real-estate space & to have less losses too. Contact us for your next retrofit & new build for a price inquiry today.